Tired of VB? Ready to make a switch? You don’t have to rewrite all your code. 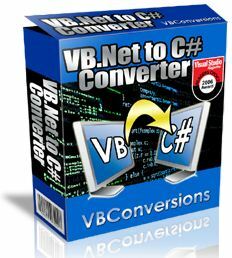 Over 99% of your code can be converted to C# automatically, with the VBConversions VB.Net to C# Converter. There is support for the latest VB.Net language features, including VB2010 enhancements like Implicit Line Continuation and Multiline Lambdas, and VB2008 features such as LINQ and inline XML. Support for the latest Visual Studio features – The latest VB.Net / C# features are supported, including Implicit Line Continuation, Multiline Lambdas, Nullable Optional Parameters, LINQ, XML, WPF, Lambda expressions, and extension methods. Support for All Project Types – Win Forms, Web, Class Library, Compact Framework, Console, etc. High Accuracy – This release was stress tested on thousands of sample programs. Tested were hundreds of Microsoft sample projects (Visual Studio SDK samples, DirectX SDK projects, Windows 7 SDK samples, etc. ), in house and customer projects, third party control samples (Infragistics, ComponentOne, Telerik, etc. ), and open source projects from SourceForge and CodePlex. Ease of Use – While the conversion logic itself is complex, using the converter isn’t. You are guided through each step of the process with easy, clear instructions. Customization – Not every project is the same. With dozens of conversion options to choose from, you are in control of the conversion process. Convert Single Projects or Groups of Projects – You can create lists of programs and convert them with one click. There’s also a command line version included. Comprehensive Reporting – There are reports showing potential trouble spots in your code, interesting things which happened during the conversion process, and any C# compiler errors which need to be fixed.